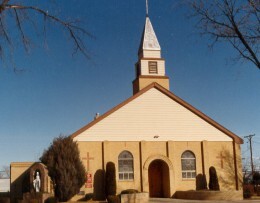 St Jude Catholic Church is located in the town of Dove Creek, Colorado. Dove Creek sits in dryland farming terrain. 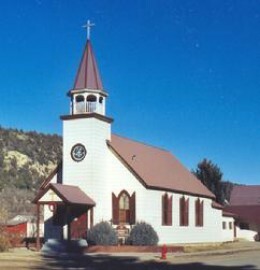 The church structure was originally built in 1929 in the lumber town of McPhee, Colorado, of golden ponderosa pine from local forests. The beautiful wood interior is a welcoming environment for parishioners and visitors alike. 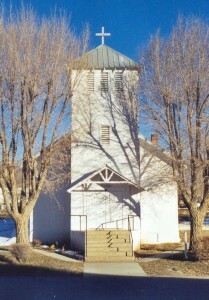 Originally dedicated as Our Lady of the Assumption, after the town of McPhee died during the Great Depression, the church was abandoned. 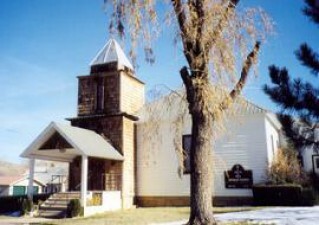 In 1948, the decision was made to move the church to Dove Creek, more than 30 miles away. 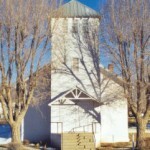 The harsh winter weather caused a delay, and delivery of the church to Dove Creek did not happen until 1949. The church was dedicated on September 5, 1949. The couple who donated the moving expenses were allowed to name the church and chose to name the church St. Jude,. St. Jue is the patron saint of impossible causes. St. Jude, also known as Thaddaeus, was an Apostle of Jesus. He is the patron of desperate and impossible cases. St. Jude’s feast day is October 28.